If you are like most parents, you may be hearing about clefts for the first time and so some explanation may be helpful. 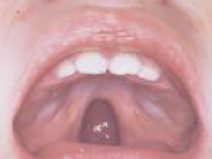 In simple terms, a “cleft” is a separation of parts or segments of the lip or roof of the mouth. A cleft lip is a separation of the two sides of the lip and often does involve the bones of the upper jaw or upper gum. It is natural to wonder why the cleft occurred and what may have caused the clefting. Presently, there is no single cause of clefting. We do know that clefting is a result of a combination of inherited factors (genes) probably interacting with certain "environmental" factors. Clefting occurs very early in a pregnancy (4 weeks – 12 weeks after conception). 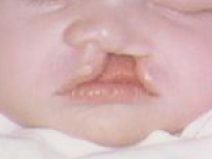 Many parents feel "at fault" for somehow causing the cleft. It is important to remember that this was not caused by something you did or did not do during pregnancy. We encourage you to ask specific questions and express your concerns when your child is examined at the Cleft Palate clinic. For additional "clefting" information, you may wish to visit our Links page and click on any of the resources. The first and primary concern is that your infant thrives and remains healthy. Your pediatrician and other specialists will work with you to insure your infant's good health and development. Each baby is a special gift. Each baby requires that special love and care that only parents can give. Sometimes, the baby with a cleft does experience some "feeding difficulty." Should this be a concern, we can assist. Simply contact our clinic office (814) 314-0048 and we can schedule your baby for a clinic visit.